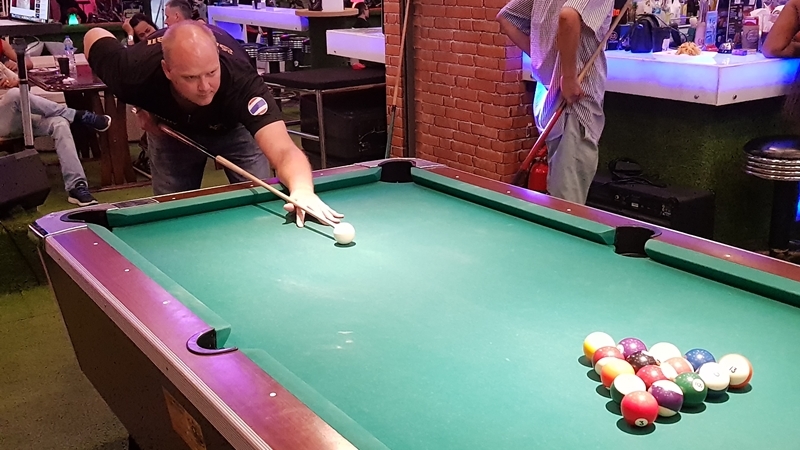 POOL: It was the battle of the giants in week 11 of the Patong Pool League (PPL), sponsored by Thailand Pool Tables, Genius 2 Garden and Restaurant and Tualek Whisky, played last Thursday (Aug 9) as first and second placed Caddy Shack and Natalie Bar took on each other at the latter’s venue. This game was set to be one of the highlights of the season and it certainly didn’t disappoint. Come the night, Tommy offered to assist Natalie Bar due to their team numbers being down, and Ben Bradley was asked to replace Justin from Caddy Shack who has recently gone through and operation for a broken shoulder sustained when he sleep-walked and tripped over his dog. Nui and Andrew from Natalie Bar won their singles and doubles games as did Dr Ben and Paul (alias Elvie) from Caddy Shack. Natalie Bar was leading the game 5-4 as they entered the beerleg and it looked like Caddy Shack might suffer their defeat the season. However, Caddy Shack’s strong will to maintain their status as the top team in the PPL provided them with the strength needed to finish the beerleg in just two sets in their favour. This resulted in a 5-6 win for the league leaders who have now extended their lead over Natalie bar in the league table to five points. Meanwhile, Red Light, which has recently been put up for sale, played at home against Wombat with Red Light’s Tony and Andy Heath again winning both their singles and doubles games. Kob playing for Wombat also won his singles and doubles games. The beerleg was won in two sets by Red Light giving them a 7-4 win. Elsewhere, Simon & Oil’s were playing at home against Kwans Birdie Team and Goh and Jay started really well for Kwans winning both their singles and doubles games as did their teammates Mike and Se. However, cool and talented Luuk playing for Simon & Oil’s didn’t want to be outdone and also won his singles and doubles games. At the end of the singles and doubles matches it appeared that Kwans Birdie team would be walking away with an easy victory. However, Simon & Oil’s had different ideas and came back strongly in the beerleg winning it in two straights sets. This reduced the damage for Simon & Oils who were happy to finish the night suffering a 4-7 loss. Happy End played at home against Ting Tong Bar. Happy End got off to a great start with Chris, Teacher Tak and Bruno all winning their singles games but Ting Tong managed to pull back and win three singles games of their own. Happy End managed to pull away from their opponents in the doubles with Chris, Teacher Tak and Bruno again managing to win their matches. However, the ultimate proof of superiority came in the beerleg which was won in two sets by Happy End who even managed to seven-ball their opponents, who left the bar quietly but took their 8-3 loss with dignity. Finally, in a game postponed until Sunday (Aug 12), Kiki Sports Bar played a home game against Martin Swiss with Kiki and Gervais winning their singles and doubles games for the home team, but not to be outdone, Chris and Aye from Martin Swiss won theirs too. Scores in the singles and doubles games meant it all went down to the beerleg which Martin Swiss took in two sets giving them a 4-7 win over Kiki Sports Bar. Weeks 12 and 13 of the PPL will be played on August 16 and 20 and people interested in playing or spectating are welcome to attend any one of the 11 participating bars. You can also visit their Patong Friendly Pool League Facebook page.